You've probably heard all the hype surrounding self-driving cars. But have you heard about the latest in technology related to air travel? No, it's unlikely that airplanes will fly themselves anytime soon. But air travel is seeing its own innovations -- and these advances involve the sole use of solar energy to produce flight. In 2002, Swiss pilots Bertrand Piccard and Andre Borschberg launched the Solar Impulse project, an initiative to make air travel more environmentally sustainable by eliminating the need for traditional fuel. The goal of Solar Impulse is to influence the future of air travel -- and, in doing so, help save the planet -- by relying entirely on power from the sun. The current adventure, which has been ongoing since the initial takeoff from Abu Dhabi, United Arab Emirates, in March 2015, is the completion of a round-the-world flight with a solar-powered aircraft called Solar Impulse 2. 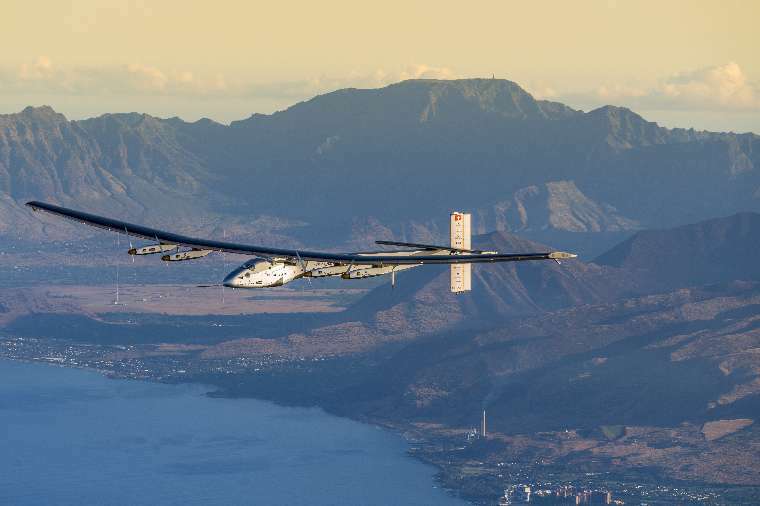 The airplane has already set impressive world records, including its status as the first aircraft to traverse an ocean (the Pacific) on solar energy, as it successfully flew to Hawaii from Nagoya, Japan. The round-the-world adventure is far from over. By the end of its travels in 2016, Solar Impulse 2 is expected to cover approximately 35,000 kilometers -- which means about 500 flight hours, between two pilots, in an unheated and unpressurized cockpit. The lightweight aircraft was not designed to deliver passengers, but rather to deliver the message that society can make giant strides toward a more sustainable future through the use of clean energy. Where is Solar Impulse 2 now, you might be wondering? The answer is that the 2.3-ton, solar-powered aircraft just landed at Phoenix Goodyear Airport on the evening of May 3, and its much-anticipated arrival was met with plenty of applause from locals. The airplane, piloted by Borschberg during this leg of the journey, left from Mountain View, California, earlier that morning, resulting in a 16-hour trip. Still, Borschberg said, this was a short flight compared to some of the adventure's other legs. The record-breaking trip from Japan to Hawaii took five days and five nights to complete. Both Borschberg and Piccard, who was responsible for piloting the plane from Hawaii to Silicon Valley, say they rely on techniques such as yoga, self-hypnosis and meditation to stay alert while in the air. While Solar Impulse 2's landing at Goodyear Airport was not open to the public, the hangar held a public viewing of the aircraft on Friday, May 6, and Saturday, May 7. The plane is expected to depart from Phoenix this week and make stops in a few more U.S. cities before touching down in New York, from which point it will make its way across the Atlantic Ocean to Europe or Africa. Solar Impulse 2 boasts a 72-meter wingspan, which is as wide as that of a Boeing 747, despite being the weight of a car. It's powered by 17,248 solar cells and four propellers, which run on stored energy at night. The aircraft is capable of reaching altitudes of up to 28,000 feet. Solar Impulse 2's journey has proven that a single-seat airplane is capable of traveling long distances on sun power alone. But how likely are we to see multi-passenger, commercial aircrafts adopt a solar approach to fuel? The fact is that clean, renewable energy has gained popularity in a variety of contexts for the last several years. For example, in 2006, the Arizona Corporation Commission enacted the Renewable Energy Standard and Tariff (REST), which stated that electric utility companies must produce at least 15 percent of their power from renewable sources by the year 2025. The use of solar power specifically has increased dramatically in homes since 2011. Solar energy sources, including heaters, water pumps and roofing panels, are in high demand and have dropped in cost over time. But when it comes to air travel, the issue becomes a bit more complicated. The idea of solar-powered airplanes is interesting in theory -- after all, the aviation industry accounts for 3 percent of society's global warming footprint and is facing pressure to reduce its carbon dioxide emissions because of the deleterious effects on climate change. The problem is this: Despite the success of the Solar Impulse project, it's unlikely that solar technology can be applied to a passenger aircraft like a Boeing 747. Compared to the lightweight Solar Impulse 2, a Boeing 747 has a take-off weight of at least 350 tons, despite its relatively equal wingspan. It would be extremely difficult, if not impossible, for engineers to add enough solar panels to an airplane this heavy using existing technology. Solar Impulse 2 is also extremely limited in speed, reaching a maximum of only 43 miles per hour (slower than a car or train). By contrast, passenger aircrafts often fly up to 570 miles per hour -- and consumers aren't likely to sacrifice travel speed in exchange for greener energy sources. One more issue is that there's a limit to how far a solar-powered plane can fly without stopping to recharge. That's why Solar Impulse 2 has touched down so many times during its sojourn across the world. Since pilots can't pull from a constant source of sunlight, particularly at night, Solar Impulse 2 must often rely on its Lithium-ion batteries, which means that the aircraft can only fly 1,000 kilometers at a time. When asked at a press conference whether commercial airlines would ever be fueled by solar energy, Piccard said it would be "crazy to answer yes and stupid to answer no." He continued: "Today we couldn't have a solar-powered plane with 200 passengers. Maybe one day." So, don't expect your vacations or business trips to be solar-powered any time soon. Nevertheless, the Solar Impulse initiative, with its high level of publicity and innovative nature, is still effecting immediate change by raising awareness about the importance of sustainable living -- even if that means you're just a little more diligent about recycling this year. Holly Whitman is a writer and journalist tackling global issues from environmental problems to human rights. You can find her on Twitter at @hollykwhitman or her blog, Only Slightly Biased.